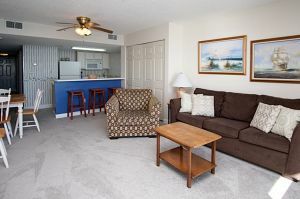 Amplify your North Myrtle Beach, SC beach vacation with reservations for the Verandas by the Sea 1102 beach vacation rental condo. Perched high atop this North Myrtle Beach resort, the unit boasts of amazing views of the Atlantic Ocean and its white sandy beaches. This North Myrtle Beach, SC vacation rental is a one-bedroom, one-and-one-half-bath North Myrtle Beach, SC condo that can sleep six people. 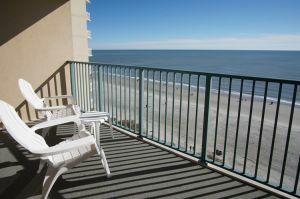 Anchored by one glorious oceanfront balcony this North Myrtle Beach, SC beach vacation rental condo lets in lots of sunlight and sea breezes when the blinds and doors are open to the balcony. 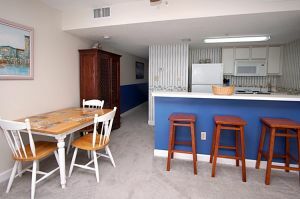 The living room is comfortably furnished in this North Myrtle Beach, SC rental condo and the dining table is as handy for serving meals and snacks as it is for playing family games. 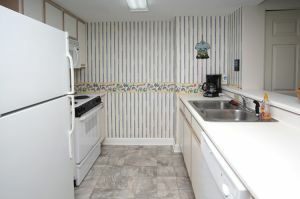 This North Myrtle Beach, SC beach vacation rental condo has a beautifully appointed kitchen with full-size appliances. 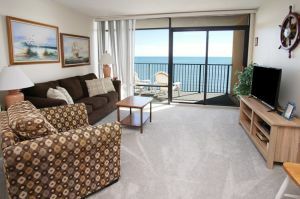 This North Myrtle Beach rental condo also has wireless Internet access so bring your computer. No worries about dirty clothes while you spend your North Myrtle Beach, SC vacation getaway at this North Myrtle Beach, SC condo because there is a washer and dryer here. If you like golf, bring your clubs to this North Myrtle Beach, SC beach vacation rental condo because this resort is close to more than 100 Myrtle Beach golf courses. A lazy river on the oceanfront pool deck wraps around the landscaped grounds of this North Myrtle Beach resort where palm trees are plentiful and the swimming pool sparkles in the sunlight. 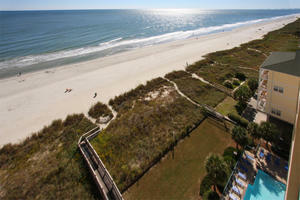 Beyond the resort, enjoy the beachfront and build sandcastles during your North Myrtle Beach, SC vacation. Collect sea shells and store up memories that you can take back home with you.